Britt was known to most as “Uncle Britt” and was a favorite of the kids as he usually carried some candy with him in his pockets which he would give out to the children. [William R. Claiborne (“Bob”), a descendant of Britt, met a gentleman in 2002 while at the annual Lebanon Church picnic who knew Britt and relayed the story to Bob.] As a strawberry farmer, Britt was an active member of the McRae Fruit and Truck Growers Association during the 1920’s. Later in life Britt would serve as the town constable in McRae, Arkansas. His job was to check all buildings at night to make sure they were locked. Jennie would die around 1900, but it is not known if Jennie died in childbirth during the labor of her daughter Mary, or if she died for some other reason shortly thereafter. Not long after Jennie’s death, on 9 December 1900, Britt married Georgia Ann Nichols. [Georgia Nichols was born in February of 1879.] 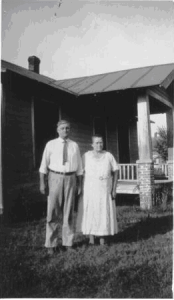 After this marriage and the birth of their twin sons in March 1903 in Arkansas, the family moved to Antelope, Logan County, Oklahoma, where Bob is listed in the 1910 census as a farmer. This same census indicates Georgia gave birth to three children with one living, so the couple must have had another child who died young. The family moved back to White County, Arkansas, before 1918, as son Robert’s World War I draft card indicates that he and his father are both living in McRae, Arkansas. In the 1920 census, Bob is a farmer in White County with his wife Georgia, daughter Mary, and son Sam in his household. On 11 January 1946, Britt died. Because he was such a large man they had to order a special casket for him. [Email from Bob Claiborne to Joshua Andrew Claybourn, April 2007.] Georgia followed in death less than a month later on 9 February 1947. Robert Chester Claiborne was born on 31 January 1897 in McRae, Arkansas. He ended up in Denver when his car broke down on his way to Oregon with a friend. They knew people that had moved to Denver and stayed with them, but Robert ended up staying in Denver for good. There, while working for Gates Rubber Company, he would meet Goldie Minnie Disney (born on 14 December 1901 in Garber, Oklahoma). The couple married on 14 August 1927 in Denver. 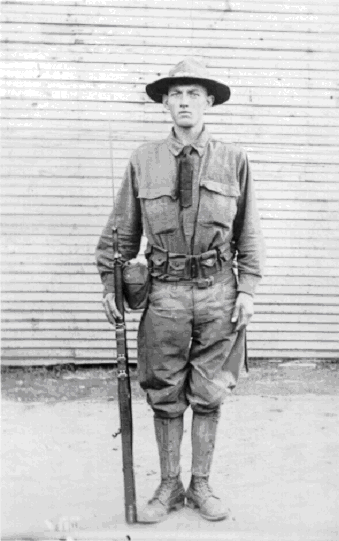 Robert was drafted in the Army for World War I and underwent basic training. Sometime thereafter his company was put on a ship for the night and supplies were loaded in preparation to depart for war the next day. But when the next day came they received word that Germany had surrendered. They were taken off the ship and a few days later Robert was discharged. Goldie was the fifth child of Gilbert Levi Disney and Eliza Roxena Moore. Goldie’s father, Gilbert Levi Disney, was born on 28 September 1868 to James K. Polk Disney and Abbiegail Poston. Abbiegail’s spelling of her first name is unusual, but this is the way it was spelled when she applied for a Civil War widow’s pension and also how it is spelled on her headstone in Garber, Oklahoma. Gilbert’s father James served in Company I of the 26th Iowa Regiment in the Civil War. His enlistment papers, dated 14 August 1862, show him to be 5 feet, 4.5 inches tall, dark complexion with brown eyes and brown hair. He was wounded on 13 May 1864 at the battle of Resaca, Georgia at the hands of Sherman’s famous march to Atlanta. He was severely wounded and records show that he lost his left arm near the shoulder joint. He would receive a pension because of the wound. He is listed in the 1883 Ottowa County, Kansas pensioners’ role as receiving $24.00 per month. He is buried in Pittsburg, Kansas. Gilbert, Goldie’s father, was present when the Oklahoma Strip was opened in 1893. He was a farmer near Garber, Oklahoma, for a good portion of his life. The family would move to Louivers, Colorado in about 1910 and Gilbert would work for the Dupont dynamite factory there. This would only last a short time and they would move back to Oklahoma. Gilbert contracted the measles and began to put up hay when the weather was bad, causing him to lose his eyesight. 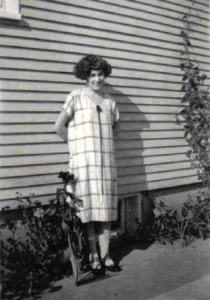 The family then moved to Denver, Colorado in the 1920’s because of Gilbert’s poor eyesight and to be close to Earl, their son, who contracted tuberculosis after being gassed in World War I.
Goldie’s mother, Eliza Roxena Moore, was born on 5 February 1871 to Harrison E. Moore and Mary Ann Oakes. Mary Ann’s birthdate is unknown but she died on 21 July 1884. Harrison was born on 13 January 1842 and died on 22 July 1885. Harrison served in the Civil War in Indiana’s 43rd Infantry. He and Mary Ann would marry on 8 November 1864 when he returned from the war. Harrison was the son of Eliza Conner and Valentine Moore. William Henry Harrison, who would go on to be elected President of the United States, married Valentine and Eliza in 1832 in Cleves, Ohio. 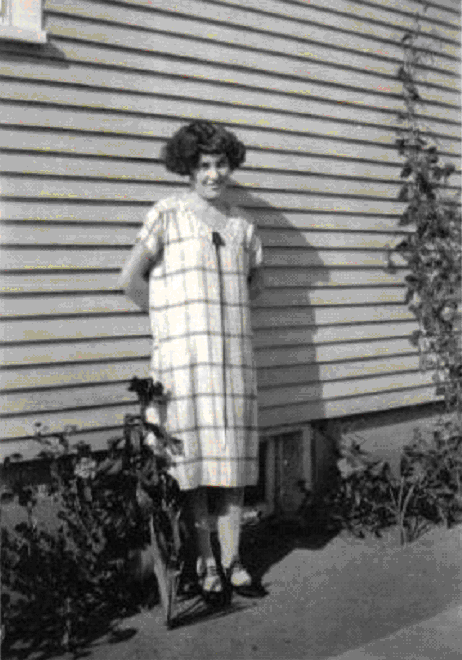 Valentine was the daughter of Kesiah Stewart and Orson Moore. Kesiah’s father was John Stewart, who was kidnapped by his uncle in Ireland so he could control the boy’s estate. Goldie’s father (Gilbert) died on 4 November 1952. Her mother (Eliza) died on 15 June 1943. Sandra Louise Claiborne was born and died on the same day on 23 December 1952. She is buried in Crown Hill Cemetery in Denver. Bailey Rae Claiborne was born on 10 March 2004. Brooke Ryan Claiborne was born on 27 January 2006. Johnathan Ryan Claiborne was born on 11 October 1981 and died two days later. He is buried in Crown Hill Cemetery in Denver, Colorado. Steven Gilmore was born on 11 May 1987. Brian Gilmore was born on 29 June 1989. Mary Ann Claiborne was born on 9 February 1899 in Arkansas. [Social Security Death Index, Arkansas, Number: 431-40-6755.] She married John Albert Boyer (1864-1930) on 28 January 1924 in White County, Arkansas. They had three children listed below. John died on 14 August 1930 and Mary Ann died many years later on 15 March 1967 in White County and they are buried together in Weir Cemetery. John D. Boyer was born in 1926 in White County, Arkansas. He married Lillian Iris Rogers (1932-2008) on 4 April 1953 in White County. They had one child, son James Boyer. Lu Ella Boyer was born on 30 September 1928 in White County, Arkansas. She married Troy Braden Sowell (1913-1997) on 1 December 1944 in Faulkner County, Arkansas. They had two sons. She died on 29 July 2014 in Faulkner County and they are buried together there in Grissard Cemetery. Troy Eugene Sowell was born on 15 September 1945 in Faulkner County, Arkansas, and died there on 21 July 1994. He served in the U.S. Navy from February 1965 to October 1967 in the Vietnam War. Paul H. Sowell was born in 1946 in Faulkner County, Arkansas. Albert John Boyer was born on 4 December 1930 in White County, Arkansas, and died there on 25 June 2006. He is buried in Weir Cemetery. Sam E. Claiborne was born on 25 March 1903 in Arkansas. He married Erma Addis Holden (1902-2000) on 25 July 1922 in White County, Arkansas. They moved to Denver County, Colorado, between 1935 and 1940, where they lived the remainder of their lives. He died there in March 1982 and they are buried together in Chapel Hill Memorial Gardens Cemetery in Arapahoe County, Colorado. Wilma Jean Claiborne was born in about 1924 in White County, Arkansas. JoAnn Claiborne was born in about 1935 in White County, Arkansas. Linda Claiborne was born after the 1940 census, probably in Denver County, Colorado. Ed Claiborne was born on 25 March 1903. Ed died as a small child but the exact date is unknown. Sam and Ed were twins.